currently working off @lokki design he gave me at the following link here! •For most things, 3.3k to 10k ohms works just fine. •For power sensitive circuits, use a higher value. 50k or even 100k ohms can work for many applications (but not all). •For speed sensitive circuits, use a lower value. 1k ohms is quite common, while values as low as 200 ohms are not unheard of. •Sometimes, like with I2C, the "standard" specifies a specific value to use. Other times the chips application notes might recommend a value. Is the some way to turn on a insert photo feature? I see it used to be done or is it restricted to certain users? There is, the same way you were doing links earlier just with an exclamation mark leading. I think it's down to the google drive link being unfriendly - I use imgur instead. Board design to make everything fit.. Personally I'd grab a clone nano off ebay or dx.com or similar. Don't get a clone of the reader though. I've edited one of your posts to show the picture, you can have a look in edit yourself to see how to embed images. I used a different link address from imgur that's specifically for that purpose. Genuine is nice if you can afford it, but clones are excusable as long as they're not using the arduino name to promote themselves. Arduino is open source but the name is a different thing. You're doing well here, it's good. That link isn't showing up for me, are you able to give me a part number? ok, my bad. The diagram I knocked together for you was related to a motorbike project I was asked about... so while it's relevant it's not as relevant as it could have been in a better world. The Panasonic relay is a latching type, what it does differently is that when you trigger one side of the relay coil it locks in position one way, then you trigger the other side of the coil and it releases. This is what you'll use to set the car OFF or ON. We use this one so that if power is lost to the arduino for whatever reason then we don't suddenly lose power to the car while driving. Again, my fault entirely. 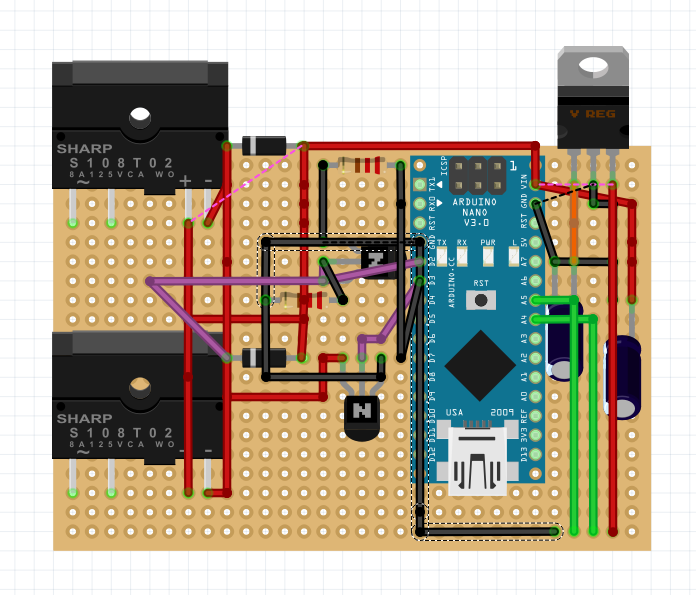 This makes the following change - you have three outputs from the arduino instead of only two. All three are basically the same, transistor/resistor/diode, and two of them go to the same relay. I haven't got a picture of the latching relay for a fritzing diagram unfortunately. @lokki all cool good sir. So if I just add another transistor and resistor with a diode in between. But put it to the second part of the relay? So does that mean I did select the correct part?